Help support the 1932 Criterion Theatre! As a 501(c)3 nonprofit organization, the 1932 Criterion Theatre appreciates your donation in any amount. Donations to the General Fund are unrestricted and will be applied to the most pressing needs of the organization, at the discretion of the Executive & Development Directors and the Board of Trustees. Should you wish to make a donation to a particular area of focus, or if you have any questions regarding gifts of securities, matching gifts, planned gifts, business sponsorship opportunities, or our Gift Policy, please contact our Development Director at: mark@criteriontheatre.org. Donate your used or worn-out vehicle to V-DAC (Vehicle Donation to Any Charity) and the proceeds can go directly to the 1932 Criterion Theatre! Simply click the V-DAC button on this page, and you will be guided through the process. Turn the jalopy in your barn or the blight on your lawn into much-needed financial support for the 1932 Criterion Theatre! Thanks! The 1932 Criterion Theatre is a 501(c)3 nonprofit performing arts venue, cinema, and community gathering space. The Staff and Board are committed to presenting the highest level of live shows, films, and special events, and to safeguarding this vibrant historic space for all to enjoy. At the core of our mission is sharing this space with our community through offering a wide array of programming. The current season features a wide range of offerings, including first-run Hollywood movies, independent & classic films, live music by world-famous and local performers, theatre, comedy performances, programs for children & families, community events, and much more! Through a generous anonymous donation in 2015 we were able to purchase the 1932 Criterion Theatre outright, and immediately begin restorations. 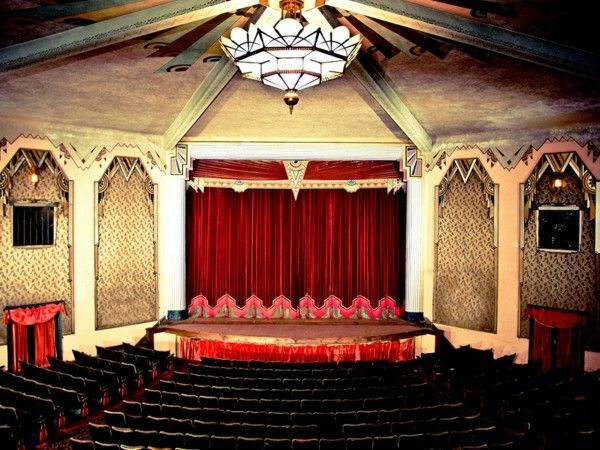 The first phase of these restorations included: acquiring brand new carpeting and a digital projector; having the seats refurbished and the stage repaired; and restoring the dressing rooms and green room. We are currently seeking funds to update the sound & lights, repair the roof, replace the curtains and drapes for the staging area, and update the HVAC system. We are grateful for your donation at any level, and please don't hesitate to contact us if you would like to to get involved. Green Room: Couches, Rugs, Full-Sized Refrigerator, Microwave, Wooden Shelving, Small Tables. Criterion (Staff) Office: Small Refrigerator, Microwave, Couch. THE 1932 CRITERION THEATRE IS SEEKING PHOTOS OF THE THEATRE’S INTERIOR & EXTERIOR FROM THE 1930’S THROUGH THE 1990’S, AS WELL AS PERSONAL STORIES ABOUT THE THEATRE FROM THIS PERIOD FOR ITS ONGOING ARCHIVES PROJECT. IF YOU HAVE ANY PHOTOS OR STORIES TO CONTRIBUTE, PLEASE CONTACT OUR DEVELOPMENT DIRECTOR AT: mark@criteriontheatre.org - THANK YOU! Interior shot of the Criterion Theatre prior to the full restoration; notice the keystone design element at the top of the Proscenium Arch.